So there are two of you in the room? Been there, done that! As crowded as it can be for two people sharing a small space, there are DIY solutions. One of my favorite ideas is to use low chests of drawers as bedside tables. The tops are wide enough for a lamp, books and a glass of water and the drawers are perfect for clothing. My husband had the tall dresser in the room and I used the two low chests with drawers that doubled as bedside nightstands. A great solution for a potential problem! An ideal height is between 27″ and 30″ and the width can be whatever size will fit nicely on each side of the bed. There’s plenty of room in each drawer for clothing or accessories. Yes, that’s possible. Usually, there’s a shelf above the clothes pole. There’s plenty of room above that shelf to add another shelf…possibly even two. There are excellent closet organizers for sale that double or triple the space. Most of them are adjustable so you can have shelves at whatever height make sense for you. And double hanging rods, too, that save so much space by hanging shirts on a rod above the rod for hanging slacks or skirts. 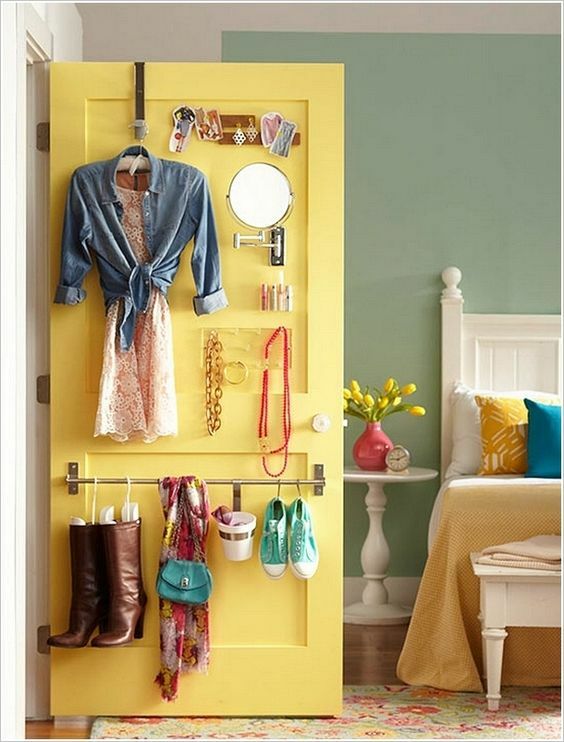 If your closet isn’t very wide, how about this idea for the back of the closet door? Consider under-the-bed storage, as well. Use clear plastic containers with wheels to store whatever you need to access on a fairly regular basis. These containers are ideal for shoes, for example. Because the bins are easy to roll out and can be opened from either end, it’s easy to choose the shoes you want to wear, then slide the bin back underneath the bed. If your bed is too low to the floor, simply purchase bed risers to place under each leg. You can find bed risers in home improvement stores or online. These Whitmore Wood Bed Risers from Target are an inexpensive and heavy duty. They have an espresso finish and add 4.375″ in height to your bed and will hold 800 lbs.! This makes sense regardless of the size of the room or the number of people sharing it! Storage in a small room can be created vertically, as well. Use the backs of doors and walls as storage surfaces. This idea of attaching two towel bars to the back of the bathroom door is nothing short of brilliant. But the same principle can be applied in the bedroom. 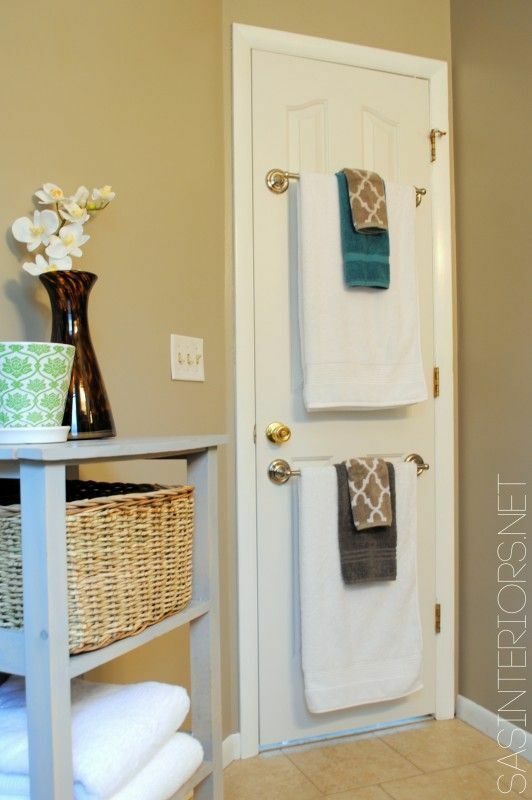 It would be perfect for hanging ties or scarves or even towels, for that matter, which frees up space in the bathroom. Especially if you only have one bathroom. 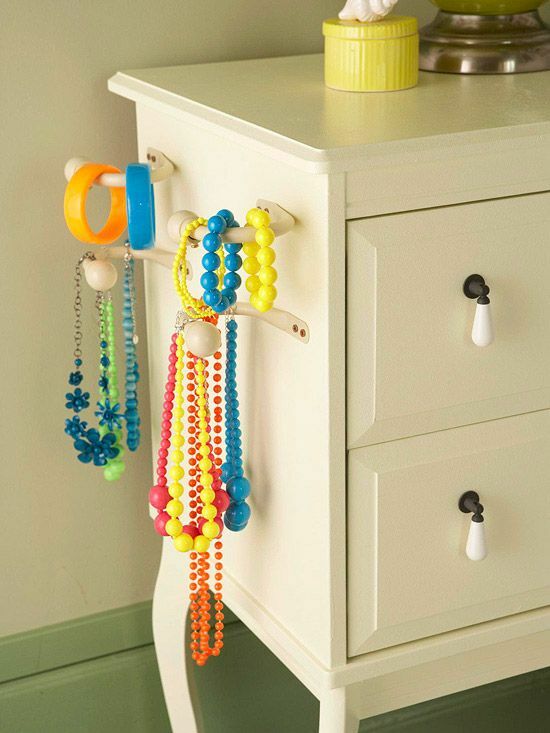 Consider attaching hooks to the back of the door or to the bedroom walls in an organized manner. It’s an attractive and functional solution. I love these decorative hooks, too, for keeping jewelry in order. Every opportunity for being organized should be a priority in a small space. These suggestions can be applied to just about any room. You’ll be amazed at how simple it will be to keep everything in order once you actually have it in order! See which of these ideas will work for you. You’ll find that it’s easier to stay organized once you get organized! Check out my Pinterest board on Small Space Solutions, too. I’d love to post photos of your small bedroom storage solutions so be sure to send them to me in the comments! This entry was posted in Bedroom Storage, Maximizing Space, Multi-purpose storage ideas and tagged Bedside Nightstands, Closet Organizers, Dot & Bo, Small Bedroom Storage Ideas, Vertical Storage. Bookmark the permalink. I live in a small house with 4 other family members, and we have 3 small closets so there is clothes all over the place as you can image. You have some really good ideas, as matter of fact I totally forgot about the vacuum seal bags and they have been around for a long time. Winter is on it’s way and its time to put away those summer clothes, and I will have to buy me a few vacuum seal bags. The other great idea you had was hanging clothes on the doors which I never thought of before. Thanks for the article it really helped me fix some of my dilemmas. Hi Dora! Thank you for stopping by and commenting on this post! So happy you found some useful ideas. You might also want to check out the post I wrote on Multi-purpose Storage Ideas for Small Spaces. There are some great ideas on extra storage options for other rooms of the house, too. I’d be happy to offer suggestions to any decorating dilemmas you have, too. Just ask! Also, if you’d like to stay updated on my new posts and my soon-to-be-published monthly newsletter, be sure to subscribe on the blog. Great post. I definitely need to rework my closet. There are so many things there that I’ve not used for more than a year. Wow. Right. At least I had it right with the storage boxes. This post comes just at the right time because I will soon be sharing a small with a sibling and it so happens that we both care so much about organization. The ideas presented in my post have really opened my mind, and somehow some of the anxieties associated with sharing the same room has been eliminated. Thanks for such a great post, full of brilliant ideas. Thanks so much for the wonderful comments! I agree that storage boxes solve all sorts of storage problems. You might want to also read the post I’ve written on Multi-Purpose Storage Ideas . There are some great ideas for storage in almost every room of the house. I wish you all good things when your sibling moves in with you. Between the two of you, I’m sure you’ll have everything under control! You might want to subscribe to my blog for updates and new posts, too. I’m also working on a monthly newsletter that I hope to have ready to publish very soon! Thanks again, for visiting my blog. Those are great ideas. Something very different what you find on the internet… Very simple but great looking and practical at the same time. Something that I have to try is utilising vertical spaces. It’s very clever to hang something on the door and even if the door is open nobody can see anything :). Decorative hooks is something practical and at the same time it will be nice piece of decoration on the wall. Thanks for sharing this great post! Well, I am so happy you found this post useful! I do try to use the backsides of the doors in my home. You’re right…nobody can see back there! In my small laundry room I have hooks behind that door to hang my mops, etc. You might enjoy another post I’ve written. It’s Multi-purpose Storage Ideas for Small Spaces with ideas for almost every room. If you’d like to stay in the loop, so to speak, do subscribe to Small Space Decor Ideas for new and updated posts as I write them. I’m also in the process of creating a newsletter that will be published monthly. Just a thought! Thanks for stopping and thanks for the great comment! I love the storage idea at the back of the closet door! Something I would’ve never thought of. I also like the idea of the under the bed storage containers. Where can I find those ones with the wheels? Thanks…I’m so glad you found the suggestions useful! I can’t believe I didn’t post a link to underbed storage with wheels…will have to fix that. I actually like this one: Sterilite 14988004 56 quart/53 L Wheeled Latching Box (4 Pack) because you get four of them so could easily use one or two in different bedrooms but there are lots of others to choose from on Amazon. Thank you for visiting! If you’d like to get regular updates and be one of the first to receive my soon-to-come newsletter, please subscribe! -Tall, stackable storage containers for the kitchen pantry. -Baskets for linens or pillows. Or baskets on gliders in the pantry. I just love baskets! -Maximize your storage spaces by adding shelves. -A foldable step stool to reach the high shelves! -A decorative trunk or storage ottoman/bench at the end of your bed = storage + decor! Even better if it’s a bench and you can take a seat to lace your sneakers. Thanks, Brianna! I think all of your ideas are terrific. Some of them I have included in older posts such as Multi Purpose Furniture for Small Spaces and Decorating Ideas from Pinterest . But I will be updating some of my other posts to include your other suggestions – For example, I DO have a foldable stool in my kitchen…I’m 5′ tall and can barely reach the second shelf in my cabinets…don’t know why I didn’t think of that tip, myself!! Thanks again for stopping by – I do appreciate your feedback. I hope you’re having a great week. Made me realise I must start clearing out my bedroom closet and get rid of clothes I no longer use. You have some brilliant ideas must get those plastic container s for under the bed to store shoes ideal! Also I like your idea of using back of doors for storage. You have some v attractive images in the post too! Thank you for the kind comments! There are so many aspects to small space living that can be applied to any size home…especially closets! Closets are especially tricky because (a) the doors can be closed so we don’t see the mess and (b) choosing what to keep and what to get rid of is a miserable chore! Thank you! I’m so glad you found the information useful. I appreciate your visit! Hi Cheryl. Thanks for these great tips, storage space is always an issue in our home. We have limited cupboard space and 2 bedrooms. Hubby and I in one room and our 2 kids in the other bedroom. And we have one bathroom to share. I especially loved the idea of chest of drawers as bedside tables. It is so simple that I can’t believe I never thought of it! The towel rails on the back of the door also is something that would really make a huge difference to our bathroom! Oh, I’m so glad you found something useful! Thanks so much for stopping by. I’ll have more good tips, soon! Well, thanks for stopping by! I am pleased that you found the post useful and I think the bunk bed with storage solution for your son is brilliant! Boy can I relate to storage in small spaces! My partner recently moved in with me and it has been a challenge to say the least. I have lots of clothes so the closet is full. And I have an organizer and baskets! And I donated some! What saved me is that my bed has 2 large drawers at the bottom. Those became his. I try to be as creative as possible and purge as much as possible but it remains a challenge. The back of the door contains a shoe organizer as well. Every inch is used! It really IS a challenge but it sounds like you have everything under control, Emily. I’ll post new suggestions from time to time. It’s always been a learning experience for me, as well! I’ve heard both positive and negative points on using the “Un-puffed” storage bags. With the vacuum-sealed space saving bags are there any worries of “staleness” or possible mildewing when leaving winter clothes and jackets in them while storing like in the attic or in the garage and if so (this is the only thing that worries me) what can be done to prevent said issues? Thank you for your time on this issue. Thanks for the feedback, Todd! I have used the vacuum-sealed storage bags and haven’t experienced any mildewing or staleness, thank goodness! I had bedding stored in them in a cargo trailer for several months when I was in the process of moving. However, it’s possible that if they aren’t sealed properly that could happen and that would certainly be something to consider. I’ll update the post to reflect that. Thanks, again. Hi. Those are nice ideas to manage space at your home. But I have some suggestion about your website. I think the style is coherent with your niche, but this theme has a small, too small letter. I don’t know if there are other themes with better font than this. That’s all. KEEP GOING. Te tip about the boxes is especially useful. If you have any question don’t hesitate to send me a mail. Thanks, Javier, for your suggestions and comments. I agree about the font and I’m going to see about increasing the size…just haven’t had time to figure it out. But it’s something I do need to deal with as soon as possible. I appreciate your feedback.